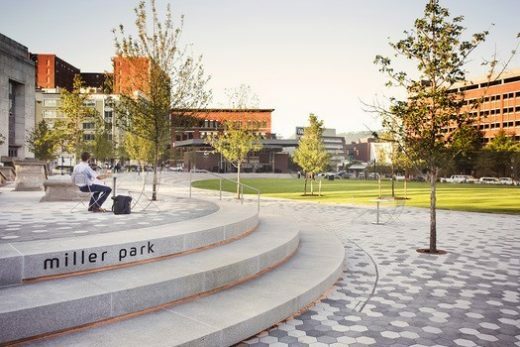 CHATTANOOGA, TN — Spackman Mossop Michaels (SMM), an award-winning international landscape architecture firm, and Eskew Dumez Ripple (EDR), an award-winning architecture firm, partnered to redesign Miller Park in Chattanooga’s thriving Innovation District. 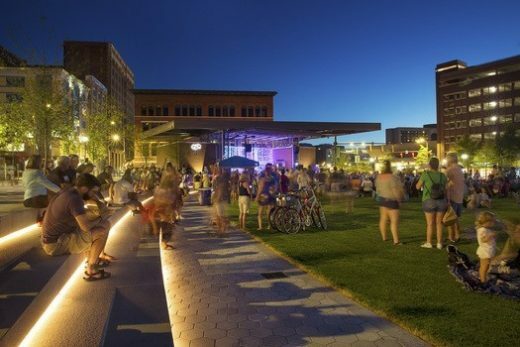 The $10.3-million project is a leading example of successful placemaking, reflecting SMM/EDR’s commitment to designing collaborative, accessible, and energized public spaces. 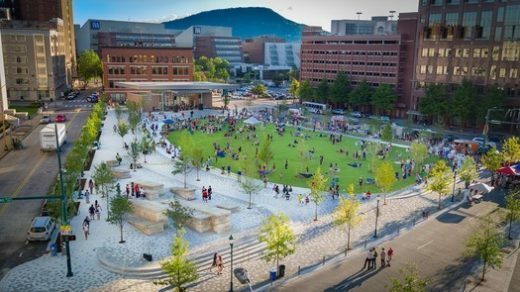 Commissioned by the City of Chattanooga, SMM/EDR led the planning and engagement process, with SMM leading the site design, and EDR designing a performance pavilion. As the heart of Chattanooga’s Innovation District, the design challenge was to completely overhaul the space because its sunken plaza created a barrier and sense of disconnection from the city. 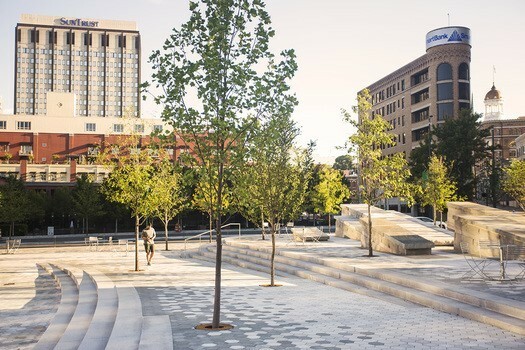 “By elevating the sunken plaza and bringing the entire park up to street level, we have made the park both more accessible and more inviting,” said Wes Michaels, Principal of Spackman Mossop Michaels. 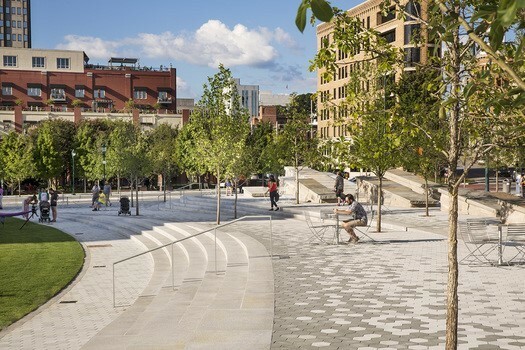 A paving pattern marks the transition between the park and the roadway, with this design continuing along the monumental stairs intended for social gatherings. These steps play a leading role in the design of the park, and easily transform into seating for everyday use and special events. More than 75 new trees, all native to the region, were planted. An expansive structural soil cell system was installed in order to allow the tree roots to grow large and wide without disrupting the pavement, as well as cleaning pollution from rainwater. These soil cells provide each tree with a large volume of soil, creating an ideal environment for a long-term urban forest of grand canopy trees. In addition to nurturing the native trees and plants, the soil cells provide excellent stormwater management that reduces the amount of water that enters the combined sewer overflow systems. While serving as a green oasis in the city center, the park is also designed to accommodate cultural events and technologically-advanced productions. Free high-speed wifi is available throughout the park, and an underground system of internet cables and electricity can support high-tech digital art installations, performances and outdoor movie screenings. The state-of-the-art pavilion designed by EDR, along with the open lawn, serve as an ideal space for events. A digital projector on the Pavilion allows for movie screenings and live performances. 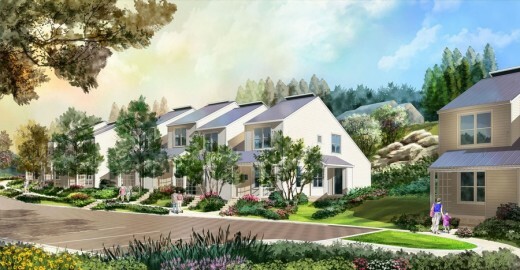 SMM/EDR took steps to involve the community in the design process. Over the course of six months, they held public meetings throughout the city, set up an online platform for collecting the community’s input, and conducted in-person surveys in the existing park and surroundings to bring a variety of voices to the table. 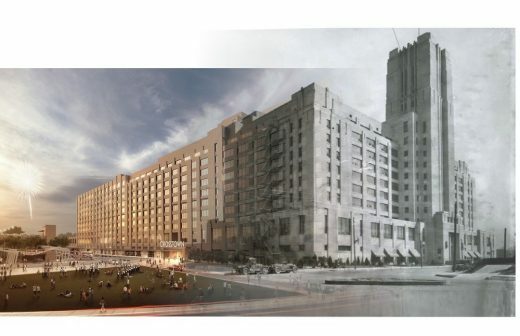 This intensive community engagement helped inform the open flexible design that characterizes the new Miller Park. 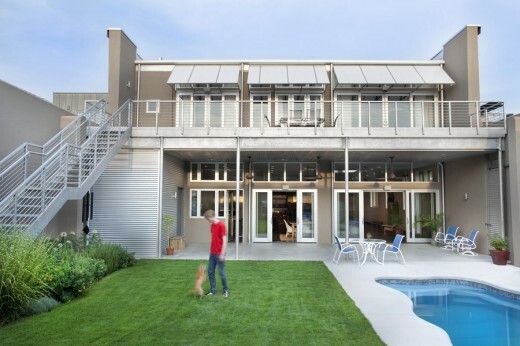 Spackman Mossop Michaels is an award-winning landscape architecture and urban design firm with offices in New Orleans, Detroit, and Sydney, Australia. Established in 1994, SMM has an international reputation for major urban revitalization and landscape projects. Building on a long track record of professional experience, the studio-based practice offers a responsive, design-focused approach to creating healthy, inspiring and resilient landscapes. 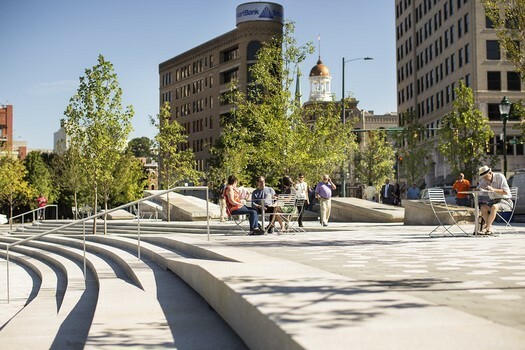 The firm is focused on creating meaningful public landscapes of cities, park and open space systems and infrastructure and is dedicated to sustainable solutions. Led by U.S. Principals Wes Michaels and Elizabeth Mossop, SMM and their experienced staff, have been involved in a wide range of design, strategic planning and revitalization projects across the U.S., including Dwyer Canal Revitalization in New Orleans and the Fitzgerald Neighborhood Revitalization Plan in Detroit. 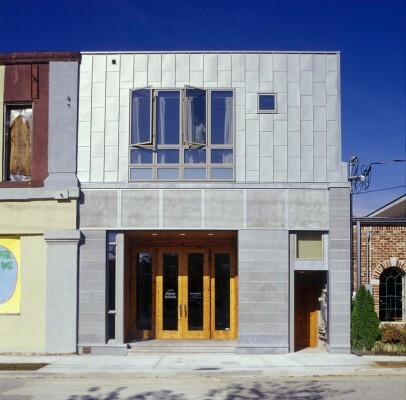 Eskew+Dumez+Ripple is a New Orleans based architecture, interior and urban planning firm and winner of the prestigious 2014 AIA Firm Award. They are widely recognized for producing award-winning, innovative projects grounded by a strong understanding of context and culture that resonates far beyond the Southeast region.